For my daughter’s birthday earlier this month I planned a majestic unicorn themed birthday party. This party was decorated with items from Canadian shops, some DIY projects from myself, and many delicious treats. One of the most popular DIY’s that I created for her party were the DIY Unicorn Party Hats that the kids got to wear throughout the party. With a spray of gold and a pop of floral these hats were sure to grab your attention. It didn’t take long to create and the cost was next to nothing in the end. Since I already had a can of spray paint at home, I made a quick trip to the dollar store, picked up some hats, faux flowers, and I was set. Follow the instructions below to create your own Unicorn Party Hat for your next party. 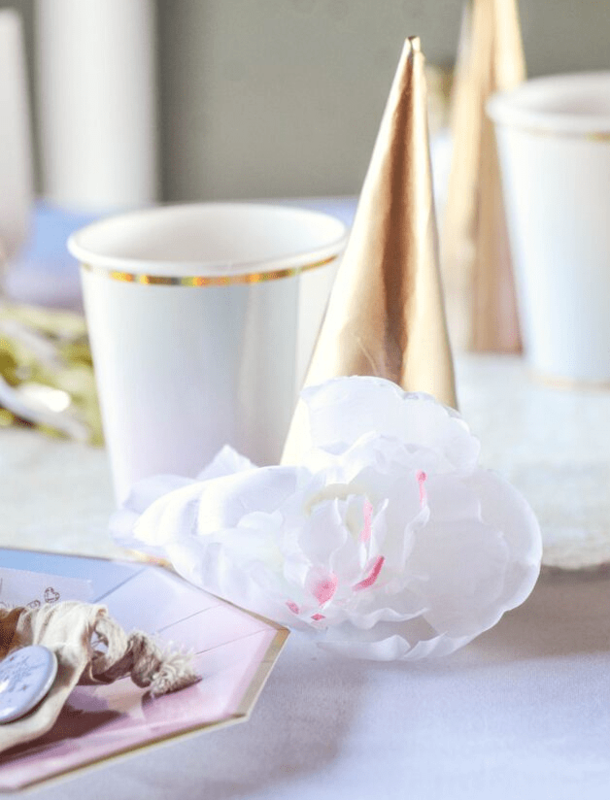 Take your party hats out of the packaging and remove all of the elastic bands from the sides of the hats. Set these aside as you will need to come back to them again later. Set up a place that is safe to spray paint. I went outside and set up a poster board that had enough space to lay out all of my party hats. Once your hats are ready, spray each one until they are completely covered. Let this coat dry, come back to them and apply another coat to the areas that did not completely cover the underneath design. Let Dry. After glueing each of your hats to their desired size and applying the elastic band, you are ready to finish them off by adding the flowers. Cut the stems of the flowers off so that you are left with just the heads. Apply glue to the base of the flower head and place onto the hat in your preferred location. Hold flower head into place until the glue has mostly hardened. Continue until all horns are complete, check back on each of your hats to make sure that the flower is secured, apply more glue where necessary. Now put your DIY Unicorn Party Hats on and get the party started.